Cool to see bona fide content in Patagonia’s clothing catalog. 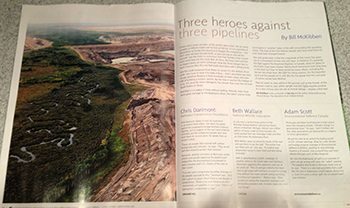 This spread starts off with a piece by Bill McKibben: “If there were seven wonders of the world’s destruction, the tar sands complex in Alberta might well be the first.” Sober stuff when you’re trying to decide to buy a $500 mountaineering jacket. Question is: Does this engender or foment “vicarious goal fulfillment”? That’s fancy psych talk for when this critical content makes the consumer feel good about himself — that he is now current on eco news — to the extent that he allows himself to buy lots of (read: unnecessary) clothes. This is similar to how the inclusion of salads on fast food menus actually increases the consumption of Big Macs.